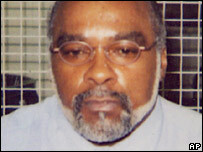 Officials and figures from both sides of the capital punishment debate have been speaking out about the execution of convicted murderer Stanley "Tookie" Williams - the former gang boss who died by lethal injection on Tuesday after the California governor denied a clemency plea. "Stanley Williams insists he is innocent, and that he will not and should not apologise or otherwise atone for the murders of the four victims in this case. "Without an apology and atonement for these senseless and brutal killings there can be no redemption. "I'm disappointed that Mr Schwarzenegger has chosen death over life, he's chosen revenge over redemption. In some sense, I think Mr Williams has become a kind of political trophy. And there are those who wanted to get this trophy. "I think that the killing of Tookie might raise a whole debate about the death penalty, life without parole and other options to another level." "The governor's 96-hour wait to give an answer was a cowardly act and was torturous. I would suggest that had he the courage of his convictions he could have gone over to San Quentin and met with Stanley Williams himself and made a determination rather than letting his staff legal adviser write this garbage." "This is bigger than Tookie Williams as an individual and even though he's going to be murdered the Schwarzeneggers of the world could never murder the spirit and that spirit is the transformation in the life of young people. "So we gonna be fighting to organise and mobilise around the death penalty issue but most importantly we're going to be fighting to organise and mobilise these young people in gangs right now." "The Supreme Court in the United States affirmed capital punishment back in 1977, and the state of California has a law that allows for capital punishment. "He certainly fits the bill, the jury heard the case and they decided he should die and, quite honestly, I think that's what needs to occur." "When you look into Tookie's case, you see 'what was the forensic evidence against him?' - the only evidence was a gun and a bullet that another gang member handed over to the police and said 'yeah, Tookie shot this'. "It's all these jailhouse snitches, and people that give information against each other, so there's a way Arnold Schwarzenegger could say 'yeah, I stand for the law, but I stand for the law that's best in America', and it's becoming very clear we have a lot of problems with the death penalty." "This is terrible because you know the death penalty is a penalty where there is no alternative, there is no possibility for the human being who happens to be a criminal - to be corrected, to reform, to become a good citizen. "With the death penalty you don't give that alternative and that is not taking into account the many, many mistakes and errors, judicial errors that we discover from time to time were committed and innocent people were executed." "We are not going to forget. I am a woman on a mission. I am going to prove that Stan was innocent and governor Arnold Schwarzenegger is a cold-blooded murderer."